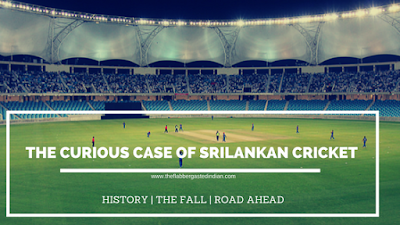 Home / Cricket / Sports / The Curious Case of Sri Lankan Cricket! 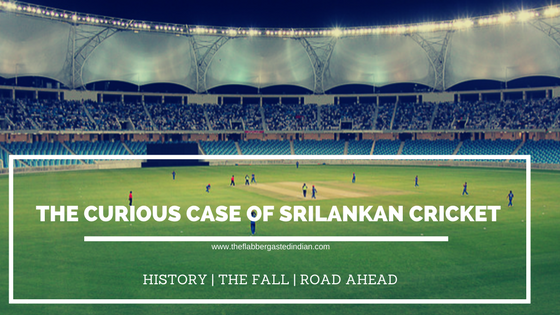 The Curious Case of Sri Lankan Cricket! With tonight's 7 wicket loss of Sri Lanka against Pakistan at Sharjah, they've extended their losing streak to 11 games in a row now which includes two home losses against 11th ranked Zimbabwe, a clean sweep at home against familiar foes India (A 9-0 loss across the formats but that is a story for another day) and currently are trailing Pakistan, another friendly neighbours, 0-4 with a game to go. The only spark of brilliance between these heavy hammerings was the 2-0 Test Series win in the newly found fortress of Pakistan in UAE. In last two and a half months, Sri Lanka played under 4 captains yet the results never changed. So, what went suddenly wrong for a team which has achieved so many highs in past two decades? Sri Lanka Played their first One Day game in 1975 and took them 4 years to find the first win and then 3 more to find a second. They were minnows of the game and showed the characteristic of being one till 1994 where any win was either an upset or against other minnows and the table was frequented by a string of losses. It was during this time only, they had a losing streak worse than the current one in 1987-88 spanning across 14 games. So, a minnow Sri Lankan team too knew how to win once in a while. 1995 was indeed a year when Sri Lankan lions started roaring loudly. In 1995, Sri Lanka for the first time in their history had more wins to show than the defeats. And it was not an aberration as the Sri Lankan Team went on to become the world champion in the following year albeit with the help of familiar sub-continental conditions, walk-overs and a friendly Kolkata crowd. Let’s delve into analysing what caused this Sri Lankan turn-around in 90s. They possessed one of the richest batting crop comprising of greats like Aravinda de Silva, Sanath Jayasuriya, Arjuna Ranatunga, Roshan Mahanama, Marwan Atapattu, Romesh Kaluwitharana, Hashan Tillakaratne, Asanka Gurusinha to name a few. They had more than formidable bowling arsenal of Muttiah Muralidharan, Chaminda Vaas, Kumar Dharmasena, Upul Chandana, P Wickramasinghe,etc. and they needed to use the services of just 4 captains with Arjuna Ranatunga leading the side in more than 85% of the matches played from 1994-2000. While this crop of players was taking Sri Lankan Cricket to higher pinnacles, a new bunch of young players were grinding it in the domestic circuit to take the torch from the seniors when time came. During 2000-2016, Sri Lanka’s core team featured names like Kumar Sangakkara, Mahela Jayawardene, Tilakratne Dilshan, Sanath Jayasuriya, Muttiah Muralidharan, Lasith Malinga, Chaminda Vaas, etc. Though captaincy of the sided rotated amongst Jayasuriya, Atapattu and later amongst Jayawardene and Sangakkara, everyone made sure that the team kept winning the matches. During this period, Sri Lanka won a Champion’s Trophy, reached knock-out of every World Cup and were Runners-Up in 2007 and 2011.The stability of that side is visible from these numbers and the results just backed it. Now let’s look at what happened after 2015 World Cup. The last of the senior players Sangakkara and Jayawardene hung up their boots. Sri Lanka could win just 16 out of 55 games with average runs/wicket 29.89 down from 31.50 in 2000-2015. After the retirement of Tilakratne Dilshan, Sri Lanka has won just 7 of its 32 games with average runs/wicket 28.34. A clear degeneration of batting has occurred post the retirement of Sri Lankan greats. Every team faces a transition period when a crop of player bows out and fresher lot is injected in the system and they take time to start producing results. Man-management and succession planning becomes extremely important during this period. It takes years to build a winning culture in the team and that culture is most vulnerable during transitions. A rut caught during transition can spread like a wildfire if not arrested at earliest. Current Sri Lankan team is knee-deep in the rut. More than the defeats, the way they’ve lost should worry them. In tonight’s defeat against Pakistan, they scored their 10th successive below 250 total. In their defence, some would say the sluggish nature of the pitches in SL and UAE can be a factor but in modern day white ball cricket, 250 is below par total on spongiest of surfaces and their opposition have regularly managed to score sub 300 scores on similar tracks. All the last 11 defeats had a pattern for Sri Lanka and it looks like they are doing nothing about it. The run rates have been painfully slow in the initial part of the innings adding pressure on themselves before a wicket or two triggers collapses. In the last 11 matches, average runs/wicket is 24.18 and average run rate is 4.55 with just 11 50+ partnerships. There were 34 single digit partnerships in it. This portrays a plain picture that the batsmen haven’t been competitive enough to pose any challenge to the opposition. Whatever little the bowlers have done, that has been undone by the batsmen. The solution for this situation needs to be found out by Sri Lanka and at the earliest. They should restructure their current domestic cricket to simulate more scenarios like the ones they face in International Cricket. Also at the domestic level, they should provide surfaces reminiscent to the ones used in ODIs. They should nurture talent and inject them periodically to the bigger set up so that the huge gaps between the generations of cricketers is not exposed. And as for the current lot, they just need to find an intent to win and stay competitive. They need to figure a game-plan and work accordingly. There are 4-5 relatively senior figure in the dressing room who should share responsibility of hanging around for at least 45 overs to put up a score. Sri Lankan team is facing a race against time as they next travel to India after Pakistan series and even the best teams have found it challenging to compete with India in Indian conditions. Unless they work around their blatant weaknesses, Sri Lanka is staring at another whitewash against Pakistan and India and even grave humiliation in upcoming 2019 World Cup.